Close on the heels of rolling out the 2013 Altima to US dealers and announcing that the 2013 Pathfinder crossover SUV will hit the markets in the fall, Nissan has now unveiled its next-generation 2013 Sentra with an overhauled interior and exterior design. 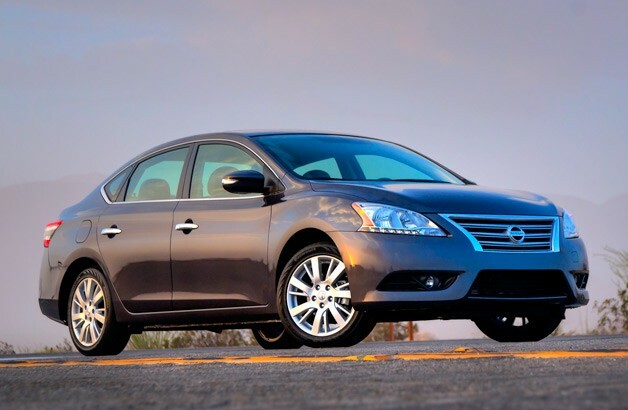 With the redesigned 2013 Sentra finally making its debut this week, Nissan said that the new car has been transformed to offer "class-above style" vis-a-vis the outgoing compact car as well as the rest of the segment. Boasting a more aerodynamic design, the all-new Sentra is 2.3 inches longer than the previous-generation Sentra. The new car also has a 0.6-inch longer wheelbase, although the overall width of the car has been reduced by 1.2 inches. With 150 pounds having been eliminated from the 2013 Sentra, the more fuel-efficient new model is capable of achieving 39 miles per gallon (mpg) on the highway and 30 mpg in city driving. The 2013 Sentra will also have a smaller, 1.8-liter, engine, in comparison to its predecessor's 2-liter engine. The new Sentra has Chrome door handles, chrome trim outlining the windows, and arrow-shaped headlights with an LED light strip on the bottom. In addition, its passenger door and the rear passenger window behind the C-pillar have also been angled off. With updated interiors further adding to the 2013 Sentra's redesigned look and feel, Jessica Caldwell - senior director of industry analysis at Edmunds. com - said: "The new Sentra is a chance for Nissan to take back its place among the more prominent compact cars."